5.1 "Living Wage, Jobs for all Act"
6 Sponsored Communist Party "Jobs Bill"
Edolphus Towns was a Democratic member of the United States House of Representatives, representing the 10th district of New York. 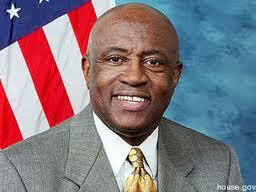 On November 2, 2010 voters in Brooklyn’s 10th Congressional District elected Edolphus “Ed” Towns to his 15th term in the United States House of Representatives. Congressman Towns serves residents of the 10th Congressional District of New York, which includes the neighborhoods of East New York, Canarsie, Brownsville, Bedford-Stuyvesant, Cypress Hills, Clinton Hill, Mill Basin, Midwood, downtown Brooklyn, Boreum Hill, as well as parts of Fort Greene and Williamsburg. This area brings together Brooklyn’s diverse populace, including Black, White, Hispanic, Asian, Caribbean, Native American, and Jewish residents. Congressman Towns views his work in Congress through the lens of his commitment to improving the lives of others as a professional social worker and ordained minister. He received his Master in Social Work (MSW) degree from Adelphi University in Garden City, New York after earning a Bachelor of Science degree in Sociology from North Carolina Agricultural and Technical State University in Greensboro, North Carolina. He is the recipient of seven honorary doctoral degrees. Rep. Towns is married to the former Gwen Forbes and they have been happily married for more than half a century. They have two children: a son Darryl Towns who was elected to 10 terms in the New York State Assembly before being appointed by Governor Andrew Cuomo as commissioner and chief executive of New York State Homes and Community Renewal, the state agency that oversees finance, development and preservation of housing; and a daughter Deidra. Congressman Towns began his political career when he left his position as an administrator at Beth Israel Hospital to become Brooklyn’s first African American Deputy Borough President in 1978. He won the admiration of Congresswoman Shirley Chisholm and she began grooming him for an eventual run for Congress. He was elected to Congress in 1982 and began a long and distinguished career in the United States House of Representatives. Congressman Towns has been a leader in Washington and actively engaged in several Congressional Caucuses including the Congressional Black Caucus which he chaired in 1991, the Congressional Caribbean Caucus, the Congressional Urban Caucus, the Congressional Mental Health Caucus, and the Congressional Labor and Working Families Caucus. Most recently he is serving as Chair of the Congressional Social Work Caucus, a Congressional Member Organization he founded in the 111th Congress to create a platform on the Hill for more than 600,000 social workers throughout the United States who positively impact the lives of the elderly, the disadvantaged, children, veterans, or other individuals in need of guidance and direction in their lives. In October 1989 the Nicaraguan Sandinista Government announced that they would no longer comply with the 19 month-old cease-fire agreement with the Contras. This had been considered a prime step forward for the "peace process" that was progressing slowly as part of the Arias Peace Plan. 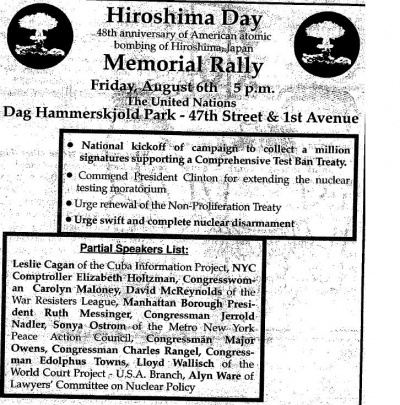 The event was sponsored by the Metro New York Peace Action Council and several other "peace' groups. H.R. 950, the Job Creation and Infrastructure Restoration Act of 1997 was introduced in the 105th Congress on March 5, 1997 by Congressman Matthew Martinez of California. It had 33 original co-sponsors, including Edolphus Towns. The primary purpose of this emergency federal jobs legislation was to provide much needed jobs at union wages to crisis ridden cities by putting the unemployed to work rebuilding our nation's infrastructure (schools, housing, hospitals, libraries, public transportation, highways, parks, environmental improvements, etc. $250 billion is authorized for emergency public works jobs over a five year period. Recognizing the impact of Mr. Hulbert James on politics, urban development, and New York City, and paying tribute to Mr. James for his lifetime of public service. IN THE HOUSE OF REPRESENTATIVES OCTOBER 6, 2011. RESOLUTION Recognizing the impact of Mr. Hulbert James on politics, urban development, and New York City, and paying tribute to Mr. James for his lifetime of public service. Members of the Host Committee included Edolphus Towns. This page was last modified on 19 May 2018, at 13:00.